I wanted to make a Frame card or shadowbox out of paper and of course I wanted to use the Gypsy. The challenge in making this card is the Miter. It took a couple of cuts and also back to geometry lessons ha ha. But I got it. The inside card is not great. But never mind that it's the outside frame which matters. I have hurriedly glued it on as I had other projects to do but wanted to get it on here before I leave and for next couple of days you will be amazed by my designer's designs and I did not want to interrupt to post this. If you have been following me I advice you to download this file , study and try on your own. This is the card -not much on the inside I agree. 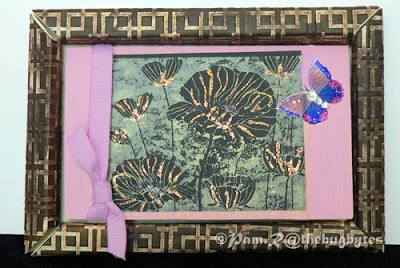 I just cut the 1st page with cream colored cardstocks - placed one on the left side and one on the right side. I used the right side half of 12 x 24 mat (ie the 2nd 12 x 12 sheet) pieces to cuttlebug and ink. If you do not want to cuttlebug you can delete that half. I just wanted to emboss and it needed to be small enough to pass through the cuttlebug. The pink/mauve card (which opens for a sentiment ) is from page 2 of the file. I just put it on so that I can cuttlebug and ink and attach to the frame. That's why the frame seems to have been embossed and brown. It's difficult embossing 12 x 12 paper so I chose to make this option. You can always cut only the left portion. 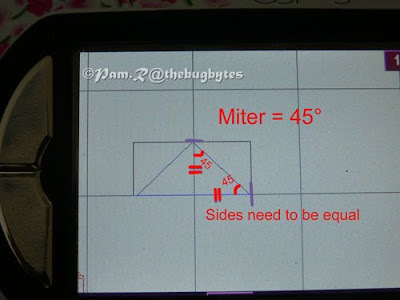 I have zoomed to show How I got the miter. Miter is nothing but an angle of 45°. and eyeballed it so that the sides are the same. Since i could not have a right angled triangle I chose the triangle , Ignored one half as If I weld a rectangle (which I had to do anyway) then I just have to concentrate on half and make sure that the height side and the other side (half of the side actually so I positioned it in the square in such a way that it was easier to eyeball and then made sure I got the sides equal so that the angle can be 45°. Perfect miter and the card turned out ok I have not tried resizing this. So don't try that first lol. So don't be afraid to play with your Gypsy. George and GW (mine is wonky so I don't try - hate that) and even don juan and plantin have some basic shapes. Try something of your own. 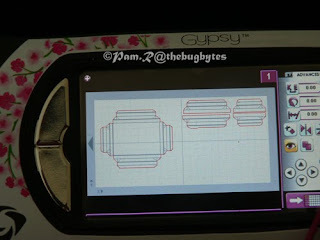 See a template and try your hand at designing.. Don't just box yourself with cartridge images. It's not bad at all to use the images. But suppose you want a particular effect - then to create that you should know how. So how do we know how? By playing.. Ha ha even animals play as that's the way they learn and sharpen their skills. So we have to play with our Gypsy (or CDS) too don't we?.. Pam, this is too difficult for the last day of the week late afternoon! LOL Great card but I would need my morning brains to think in degrees as I am a morning person. Thank you and I will download the file when I get home. Wow Pam beautiful work like always. ha ha sassy. Would do this on a Monday but unfortunately I do not have time on my hands now lol. Wow... that all made sense to me... If Mr. Craig could see me now! hahahahaha! Wow...what an amazing card. Definitely not one that I want to tackle yet! Good job. 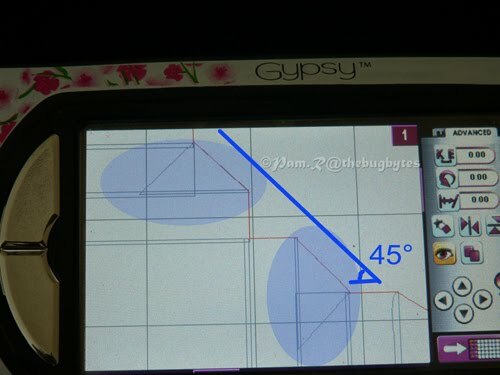 I just got a gypsy and have been inspired by all of your creative and ingenious ideas. Thanks for taking the time to share them freely with us!